I wasn't sure what I thought about this right after finishing it. A few days later, I think I really liked it. 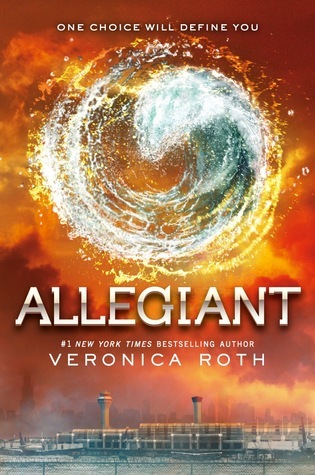 The series as a whole definitely had its flaws... particularly, I feel like it could've been two books instead of three, as Insurgent and the first half of Allegiant seemed a little bloated. I LOVED the relationship between Tris and Four. Especially after reading so much about 50 Shades and Twilight and thinking about what sort of relationships are being modeled there. Their relationship is so healthy, so real. And it's not some fairy-tale, either: they disagree about things, they make mistakes, they hurt each other. But for the whole series, they talk, they love each other fiercely, they raise each other up. They make each other better people, they give each other strength. All the way home I thought about what Amar said, about every relationship having its problems. I thought about my parents, who argued more often than any other Abnegation parents I knew, who nonetheless went through each day together until they died. Then I thought of how strong I have become, how secure I feel with the person I now am, and how all along the way he has told me that I am brave, I am respected, I am loved and worth loving. “And,” I say, “I think you’re still the only person sharp enough to sharpen someone like me.” “I am,” he says roughly. And I kiss him. His arms slip around me and hold me tight, lifting me onto the tips of my toes. I bury my face in his shoulder and close my eyes, just breathing in the clean smell of him, the smell of wind. I used to think that when people fell in love, they just landed where they landed, and they had no choice in the matter afterward. And maybe that’s true of beginnings, but it’s not true of this, now. I fell in love with him. But I don’t just stay with him by default as if there’s no one else available to me. I stay with him because I choose to, every day that I wake up, every day that we fight or lie to each other or disappoint each other. I choose him over and over again, and he chooses me. It's not just the central romantic relationship. There are all sorts of really good, interesting, complex relationships in this series. It's about the bonds between people -- family, romantic, friendship -- and how those change, and what they mean. So, yeah. The plot is a little wobbly sometimes. The writing is sometimes heavy-handed. But it doesn't even matter. These books are great.